RockUnitedReviews: NEAL SCHON: "The Calling"
Whatever you think of Journey, there’s no denying that guitarist/songwriter Neal Schon has been a hard worker over the years. He’s guested on dozens of albums as well as being involved with the likes of Hardline and Bad English, and whilst not a prolific songwriter with these projects his fingerprints are there in all the right places. I have to be honest and admit that I haven’t heard any of his seven solo albums, so was intrigued to hear what he could do without a vocalist. Instrumental albums can be a tricky thing to review, as there’s not usually any nice catchy choruses to latch on to, and obviously there’s no soaring vocals to lift a song to new heights. The most important thing, for me, is a bit of variety, as who wants to listen to ten variations of the same theme. 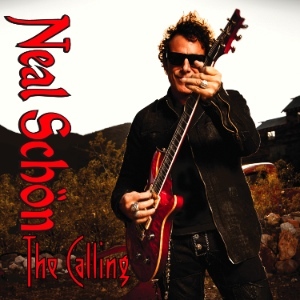 In fairness, Neal Schon seems to be doing his very best to mix it up on “The Calling”, throwing in plenty of intricate, delicate guitarwork along with some truly impressive rockier stuff. Although there’s no breakneck fret sessions here, Schon shows a deftness of touch that only comes from years of experience, happy to allow the listener to sit back and relax when necessary, such as during the laid back but technically brilliant “True Emotion”. When Schon gets going you can’t really call it shredding, as his stuff is just too, well, pretty to describe that way. Regardless, he can certainly dance up and down the fretboard at some pace when he wants to, and there’s plenty of reasons for lovers of skillful guitar to like “The Calling” as well as lovers of plain old good music. Although not really a fit for dedicated Journey fans, the influence is there in several tracks, notably the light but powerful “Blue Rainbow Sky”, which would make a superb power ballad if Arnel Pineda was given some lyrics to go over it. Schon manages to combine diversity of styles with some truly imaginative playing throughout, making “The Calling” a genuine pleasure to listen to, and certainly one of the better pure instrumental albums I have come across.